Andrew Renshaw is no stranger to Wisden having co-authored the Wisden Collector's Guide as well as contributing to the Almanack. Wisden on the Great War is a remarkable book, brought out to coincide with the beginning of World War One, and lists for the first time all cricketers who lost their lives during the Great War in one book. With little or no cricket being played during the war – and the decisions leading to this are mentioned in good detail in the early part of the book – the Almanack during the war years was little more than a catalogue of deaths with mistakes inevitably occurring. Now, with almost 1800 cricketers being remembered for service to their country as well as their feats on the cricket field, the record is within this superbly researched book. From Test and first-class cricketers to young men who may only have played cricket at school, all are mentioned in this Roll of Honour. 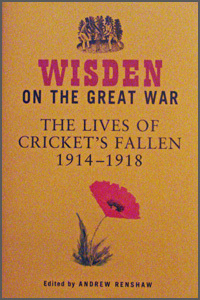 Wisden during the war years gave great solace to bereaved relations but, with the expense of obtaining copies of these years for more distant relatives now, this book can act in very much the same way a hundred years after the beginning of the conflict. Inaccuracies in the Wisden Almanack between 1914 and 1919 have been corrected, a resume given to all of the fallen and, in some cases, names have been corrected. Even more bizarrely, three people survived their Wisden obituary and lived longer, fruitful lives. It might sound odd to read of deaths in the 1977 and 1978 editions but the numbers include those who suffered disability as a consequence of the Great War as well as others who took their own lives after suffering during the conflict. Wisden on the Great War also includes a chapter on the existence of counties, country and the MCC during the war years. The extent of the carnage which the war wrought is aptly and tragically displayed towards the end of the book with a photograph and resume of the 1914 Oakham School team entitled The Lost Generation. Of the eleven boys in the photograph, one became a future England cricketer while, poignantly, five were dead by the end of the war. Wisden on the Great War is so much more than a Roll of Honour for the fallen, though. Men who played first-class cricket and who are commemorated by the War Graves Commission – which includes their date of deaths, regiments, rank and teams played for – are honoured as are those decorated for gallantry. Andrew Renshaw and the compilers who have brought this book to fruition deserve the utmost credit for their gallant efforts, hard work and research. Through their praiseworthy efforts, it means that, most importantly, those cricketers who lost their lives serving their country will have their memory preserved and, for the collector, one of the most worthy books of recent times carries the consequences of one of the world's bloodiest episodes in between the covers of just one book. It also goes without saying that Wisden's production of this impressive book is exemplary.